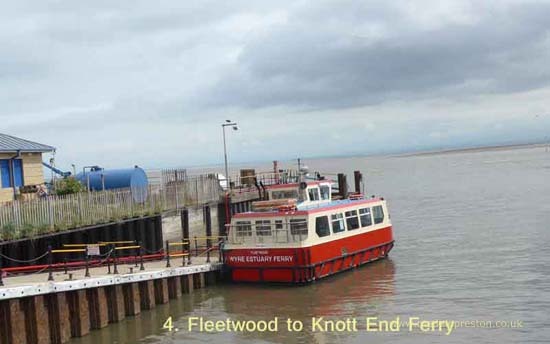 Fleetwood with the River Wyre on the east, Morecambe Bay on the north and the Irish Sea to the west. 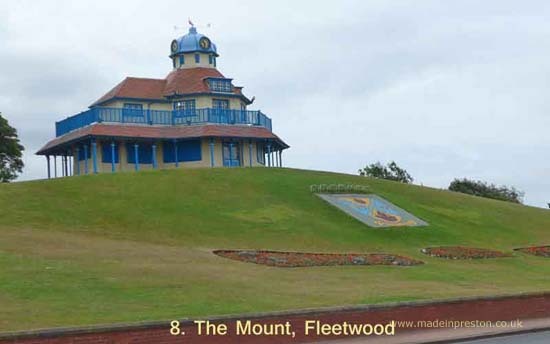 Seven miles beyond Britains greatest seaside resort is the town of Fleetwood. Once a major fishing port and the Euston of the north. 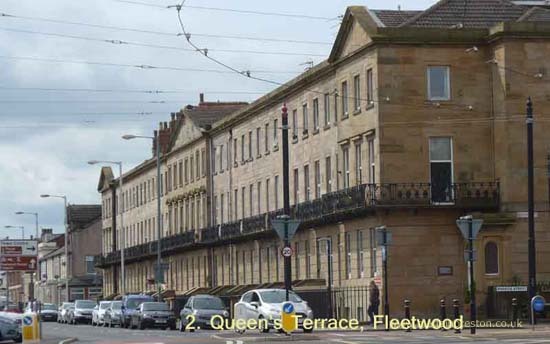 Fleetwood was built in the mid 19th Century to a planned design by Decimus Burton. Roads radiate like spokes from The Mount. It's quite a nice town with some good features although currently the main street is tired. The promenade has recently had some refurbishment and there are good views across Morecambe Bay to the Lake District and Pennines. 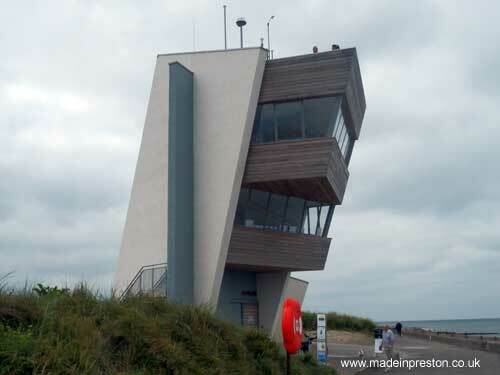 Particularly from the new Rossall Point Coastguard station. At the entrance to the town is a Freeport Outlet Centre. Fishermans Friend lozenges are made there. 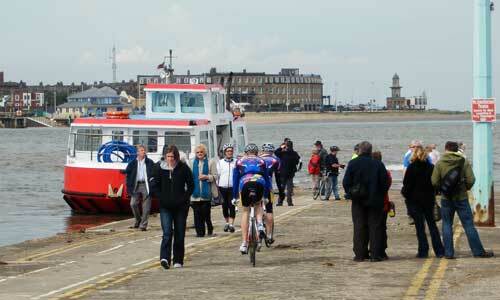 Fleetwood market is popular. Start at the Fleetwood Museum. The former Customs House. Contains a small cafe and shop and fee payable to go inside the exhibition area. A lot of interesting trawling exhibits and of the local salt and chemical industry. Walking towards the seafront on Queen's Terrace, from the museum you pass the terrace, quite attractive. Just beyond the terrace is the Pharos Lighthouse. Next to it is a traditional metal tram stop, one of the few left, of a type once seen all over the tramway. 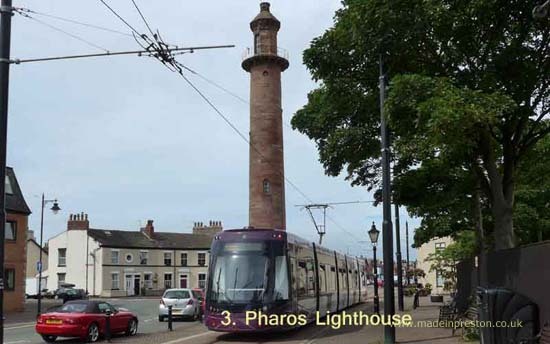 There is also a Blackpool Heritage Tram Tour stop by the lighthouse, a stop with a green circle on it. 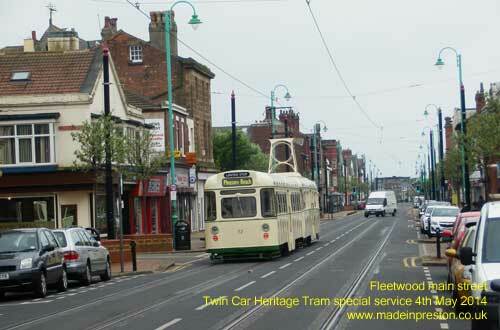 Blackpool Heritage Trams run to Fleetwood on certain weekends in the year and by special tour. Across the road from Pharos is the RNLI Lifeboat building and next to it is the ferry across to Knott End. Quite a nice little service and enabling a walk along the old railway line at Knott End if you wish. On the pleasant walk towards Marine Hall just before the Lower Lighthouse. 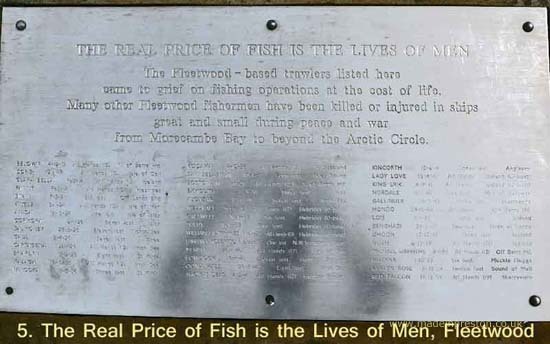 The plaque 'The real price of fish is the lives of men' lists some of the trawlers lost at sea. It's a lot. In days gone by they were small ships going out to Iceland in winter, would have been a tough life. This poignant statue of a wife and child waving goodbye to the father, husband in the trawler that could be out at sea for weeks. The Lower Lighthouse on the shore, one of three in a straight line. 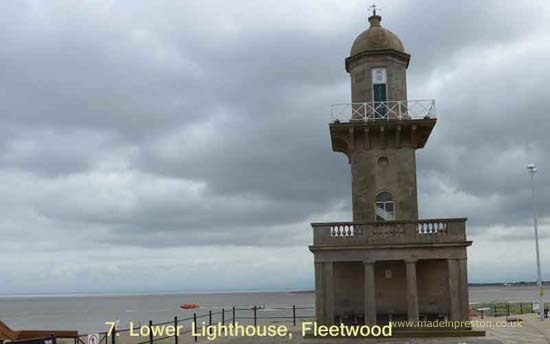 The Upper Lighthouse being Pharos and the other one being a mile out in Morecambe Bay where the channel to Fleetwood port begins. The Mount Pavilion enables nice views over Morecambe Bay towards the Lake District and ship watching. 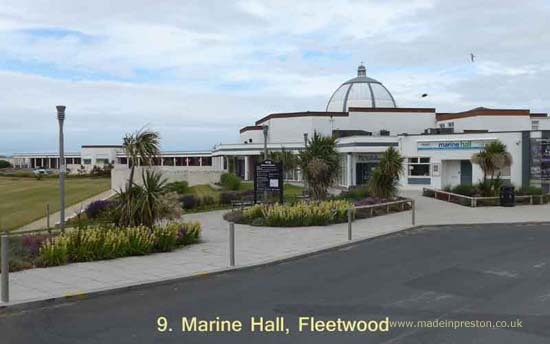 The Marine Hall has an attractive dome in the main hall and a tourist information office. Nice garden area and outside cafe with shelter. Shows are on throughout the year. From the Marine Hall a pleasant walk along the sea-front as far as you want, could be 10 miles if you wanted. 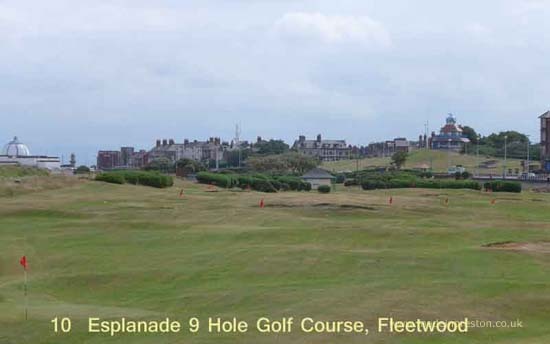 View of Fleetwood across the 9 hole golf course next to the beach. Inland, perhaps half a mile, from the road next to the 9 hole golf course. 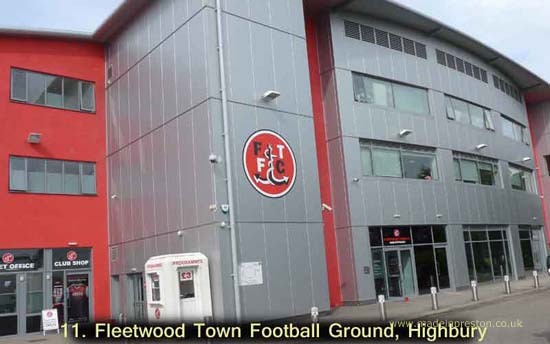 Fleetwood Town FC, Highbury Stadium. An attractive stand for one of soccer's interesting rising stars. Inside Fleetwood Highbury Stadium and the young lady from the club shop who kindly showed me inside the ground. 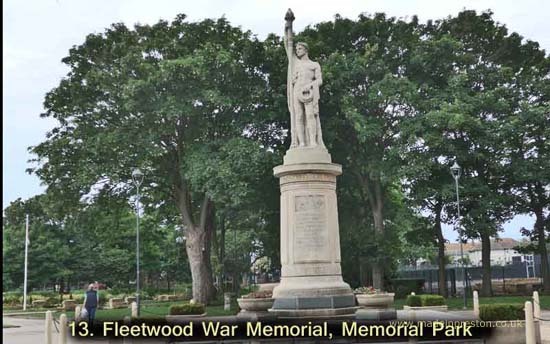 Next to Highbury Stadium is Memorial Park, Fleetwood, which has recently had a refurbishment and contains the War Memorial containing WW1 names on the main body and WW2 names underneath. 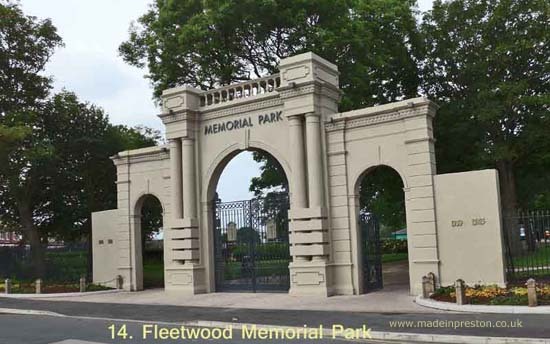 The entrance to Fleetwood Memorial Park. Returning you can walk along the street directly facing the gates to the tram or bus stop at Fisherman's Walk. 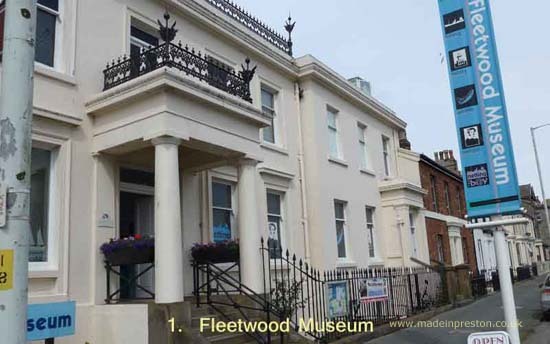 If you parked near the Fleetwood Museum you've a walk along Fleetwood's main shopping street, Lord Street, or you could get a tram or bus to Fisherman's Ferry or get off at the Library. Closed in September 2016, awaiting new ownership. 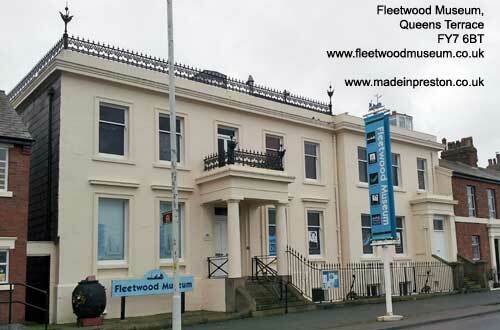 Another good feature of Fleetwood is the Fleetwood Museum. It's a friendly place with volunteer expert guides. It contains some good exhibits and has a nice cafe selling pannini and the like. Museum entrance is ?3, cheap enough, the cafe and shop are free to enter. This town has quite a short but interesting history. Planned design, the coming of the railway and the Euston of the north, salt and ICI, development of the port, fishing, roll-on / roll-off, some boatbuilding, a touch of holiday resort and the tram service. Fishing being some of the most interesting with stories of the tough life on the trawlers. The names of the Fleetwood boats, the losses, the wartime effort. 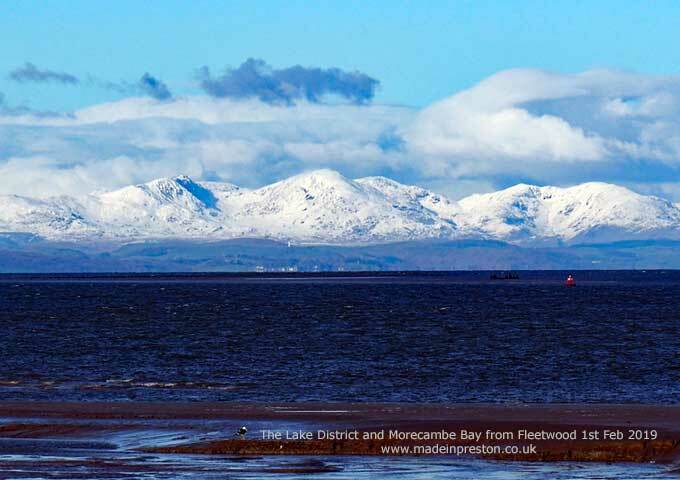 The town also has some great natural assets such as: its cosiness being surrounded by water on 3 sides giving it a compact nature and the view of Morecambe Bay beyond which are the hills of the Lake District. 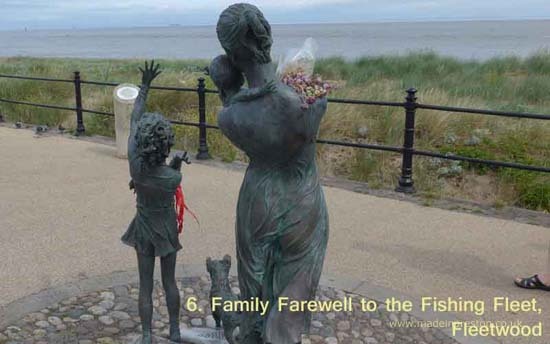 Another asset is its link with the sea which is displayed in 2 statues on the promenade showing a woman and child waving to greet a homecoming trawler ship looking out to sea and the small display 'the price of fish' listing the many Fleetwood boats lost. The main street is long and straight with a double tramline for the regular trams from Blackpool. The shops here are mainly local and don't look prosperous but it has a homely atmoshere. The chain stores are in Freeport outlet centre which has a new ASDA next door at the entrance to the main street. The end of the tramline is near the old lighthouse surrounded by terraced houses which could be termed cottages but they aren't really. On the promenade is the Euston Hotel which is quite a fine building being curved and built of large cut stone. 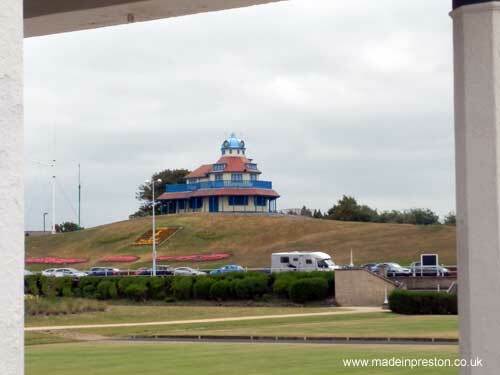 Further along is The Mount a pavilion style building on a small hill overlooking the prom. 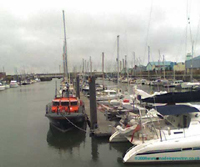 Freeport itself is built on the side of the old docks which are now a marina full of yachts. A good view at the far end of the centre. It has a large car park (free). It has improved recently in that an M&S outlet and a Costa Coffee (a good one) have been added. There is also a Next and kitchen, sports and .. well a wide range of shops. An interesting walk is from the church on main street, towards the vehicle ferry. Noting the old shop with veranda on the corner. Turn left along the front past the museum, nice terrace, note the old lighthouse inland and the compact houses. Then the Euston Hotel. Walk along the promenade taking in the fishermen statues and the view of the Lake District. Lancaster University is also visible sitting slightly raised on the edge of the Pennine Hills. Continue towards Cleveleys which is a good 3 miles. First mile is along the lake next to the sea-front, past Rossall Point, but then it gets a bit lonely in places and the sea wall flood defences block any inland view. Pass Rossall School, boarding. Then into Cleveleys which is having a large improvement programme just as you enter it on the prom including the gardens and a cinema and shops on the front. Photo: Rossall Point, Fleetwood. Stairs to the top. 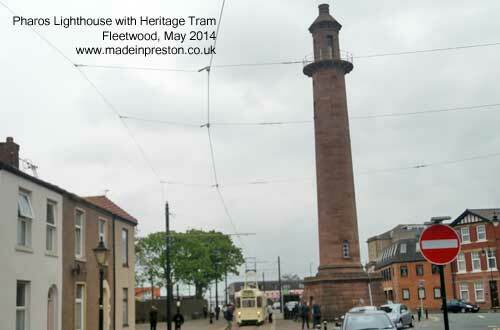 Fleetwood's history as a town began around 1840 when the Preston & Wyre Railway opened. 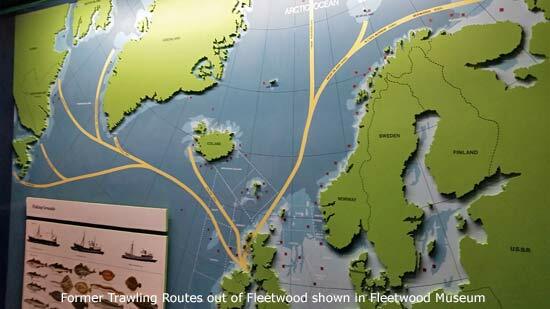 For a time Fleetwood was the northern end of the line from London and passengers would board a ship to get to Scotland. In 1847 the line over Shap was completed and the Scottish service ended at Fleetwood. At that time the wharves were along the riverside but in 1877 the Lancashire & Yorkshire Railway built Wyre Dock and this enabled larger ships to berth and further develop the town. 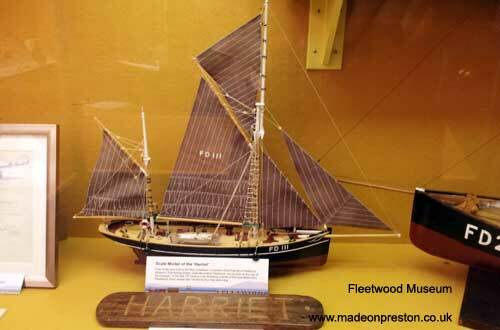 In 1841 the Fleetwood Fishing Company was formed and developed a fleet based on smacks and other trawling vessels moved to Fleetwood from around the area and further afield. Some 100 ships by 1890, sail powered and with hand equipment. Steam trawlers using coal started arriving in 1891 and these got larger and capable of travelling further and eventually diesel engined trawlers. In 1966 the largest trawler arrived, Criscilla, FD261 at 952 tons with stern fishing system. In 1958 Iceland declared a 12 mile fishing limit, then 50 miles in 1972 and 200 miles in 1975. 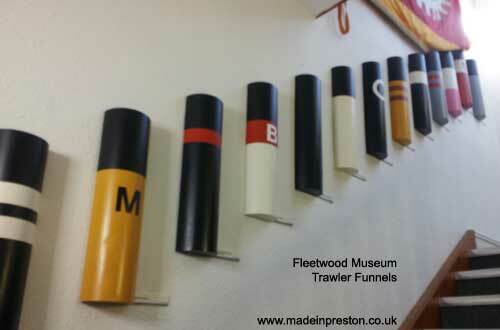 During the 70's new fishing quota's brought Fleetwood's fishing down with all the large trawlers having gone by 1983. Most information about trawling taken from Fleetwood's Fishing Industry by Peter Horsley and Alan Hirst, Hutton Press. Fresh fish from Fleetwood was a by-word of quality. The cities of Lancashire were able to get fresh fish by rail which greatly improved their diet. Today many of Fleetwood's residents still recall the trawling times; weeks spent away in freezing, gales, lashing rain to bring home the fish. An annual event held in July. Used to be mainly based on trams but now has more emphasis on buses, coaches and classic vehicles. Big funfare. The exhibits sprawl for over a mile along the main route from the entrance to the town centre to the Euston Hotel next to the coast. It gets very busy and car parking isn't easy. We usually park on the promenade although it's a bit of a walk. 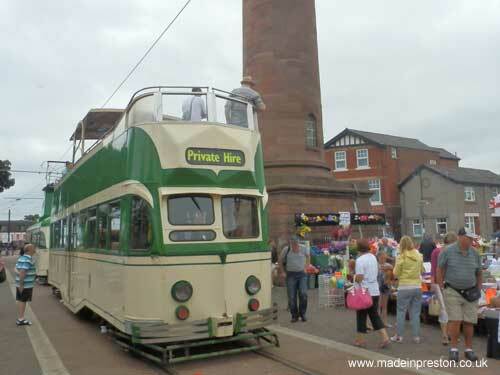 View our webpage of photos of Tram Sunday 2012 and 2013. 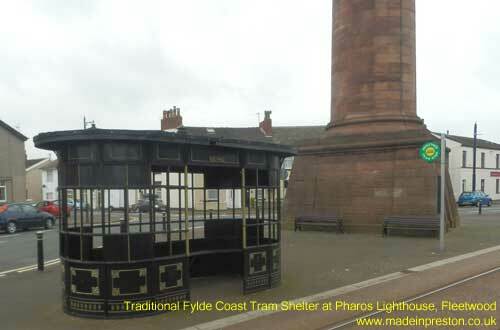 Fleetwood Tram Sunday next to the Pharos Lighthouse.